"Filtered Permeability" is a term often used by people trying to describe the act of preventing people from driving through an area, but it is a little more complicated when we need to provide access. At a basic level, "filtered permeability" utilises strategically placed "road closures", or "modal filters", to prevent people driving motor vehicles through (normally) a residential area in preference to a main road. In this case, the road is only "closed" to people driving through to gain an advantage, people who live in an area and wish to drive in and out can still do so. Deliveries can still be made and refuse collected. People can walk and cycle through with no impediment too. The image above gives a rough idea of how we can use some modal filters to keep access into an area for motors, but prevent it's use as a through route. The photo above is the same junction which has been made a little bit prettier. The common thing about the two designs is that the ability to open the filter remains - the gate can be unlocked and opened, the central bollard can be unlocked and removed. There are two reasons we may wish to do this, first, if a road elsewhere in the estate needs to be closed for highway works, then the filter can be opened to provide a temporary alternative route. Second, we might need to get an emergency vehicle through. I do not speak for the emergency services by any means, but in my own experience, they would generally treat a modal filter as a location to avoid, preferring to use the same route which drivers would normally take. Increasingly, those driving emergency vehicles may not be working a local "patch" and so satellite navigation is increasingly being used and in that case, the modal filters will show as closures. 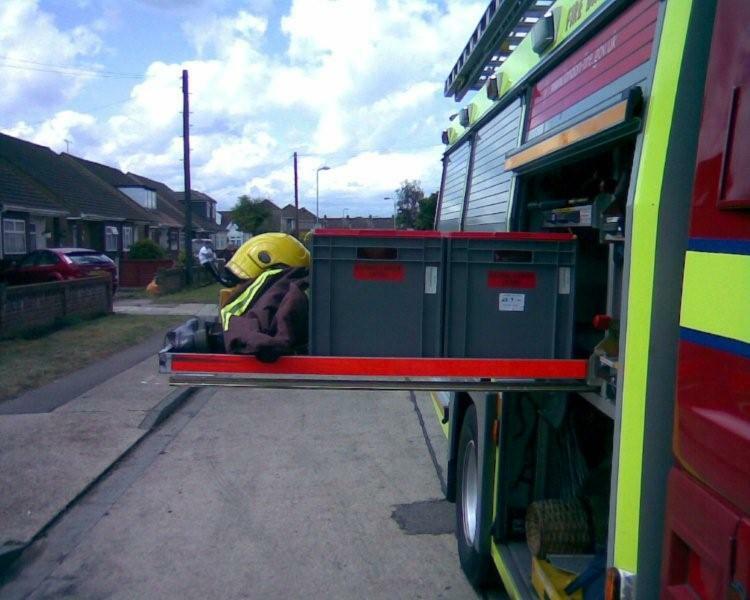 The ability to open a filter is more generally helpful some time into an incident and the vast majority of the time will be something the fire brigade will do. This is generally because the fire brigade will carry keys to the gate or bollard (normally a universal key, but local agreements operate) and the police and ambulance don't. If there is a fire or large incident with lots of "kit" on the scene, then opening a filter gives another option for moving things and people in and out of the area. Other manufacturers are available, but from my own experience, this is a good product (no, I'm not on commission either). 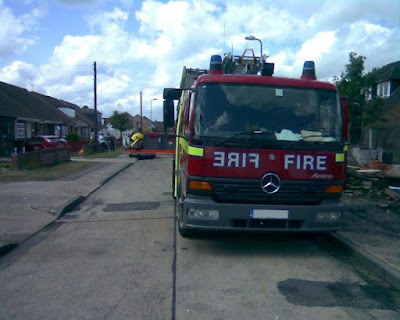 The layout in my photo has 1.5m gaps between the bollards and as they are a bit wider than 100mm, we get a slightly wider gap for fire pumps to get through. The bollards are a thick plastic and so fairly rigid to a person giving it a shove. The risk of course is Joe Public gets wind of the system and has a go themselves, but that is a wider enforcement issue. The other real advantage is for people cycling through, there is some give if they are clipped and in a crash, one should come off far better than with a rigid steel bollard. But we have yet more options. 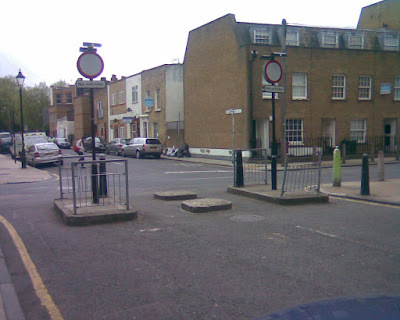 The photo below is Eric Street in East London which is closed to motor traffic (that's what the circular signs mean, despite having the unlawful sub-plate to explain). The lumps of concrete in the centre are there to dissuade car drivers, but allow fire pumps and probably ambulances through too. There is a cycle bypass on each side to, although it's not a great layout for people on foot trying to cross. Again, it uses concrete (bumpy blocks this time) to dissuade access. This is more conspicuous and can be driven over by fire pumps and (if the traffic order allows) refuse trucks. Rising bollards are a way of managing access, just as the example below in Leicester city centre. Such a system if often managed via a control centre and so takes resources to manage. It is a method which will keep non-authorised users out, but it is an ongoing cost. Many filters are physical because if someone sees an opportunity, they go for it, such is the temptation. However, with many local authorities taking on the enforcement of moving traffic contraventions from the police, solutions exist where just a couple of signs can be used, monitored by cameras. The photo above is of Orford Road in Waltham Forest. The filter here operates between 10am and 10pm and only permits local buses during that time. In actual fact the circular signs are wrong as they mean "no vehicles", it should be a sign meaning "no motor vehicles" as cycling remains permitted. 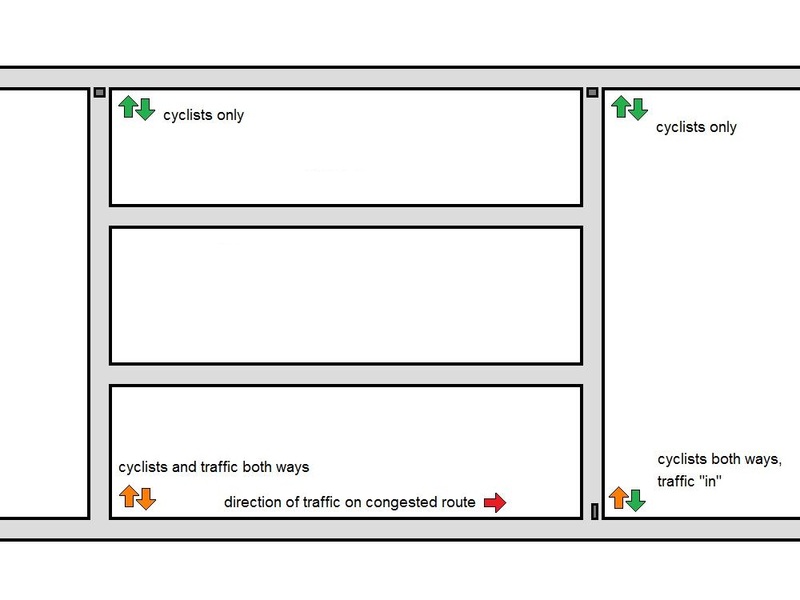 This filter is part of a network around the local neighbourhood which allows deliveries and access out of the controlled areas, but where there is no possibility of using the area to beat traffic on main roads. If there is a filter with an exception just for buses, it will often be called a bus gate (sometimes bollards are used to keep people out as I mentioned above). The camera enforcement of this type of filter is very clever. It doesn't rely on someone sitting watching a monitor all day, a computer does the hard work. The camera system will sense movement through the filter and record a piece of video. Software scans the video for a number plate and if one is found it can compare it against a database of registered vehicles (buses, emergency vehicles or whatever) and then if a non-permitted vehicle is "seen" a the video is packaged up and sent to an enforcement officer to review and if an offence has been committed, they send out a penalty charge notice. Camera enforced filters can be controversial as people (who get fined) often cry foul that the signs weren't clear, or the road layout leads into making a mistake. I do have sympathy as even though a layout might be technically correct, we should make some layout changes to make it totally clear because even totally incorrect bad press sticks in the public's mind. It's an old filter which was used to try and stop all motor vehicles, including motorcycles. It's now part of London's Quietway 1 and although the central barriers have now been moved out a bit, it's still rubbish. The answer here could be a bollards with camera-enforced "no motor vehicles" signs. Perhaps we could even be pragmatic and not worry too much about motorcycles and let people through given the tiny mode share involved. The key points when looking at modal filtering is to think at a network level first and also consider that fire, refuse and delivery access will be needed. Try and avoid filters which require the drivers of large vehicles to reverse or perform three-point turns. If there is a bus route, then access is easily maintained with a camera-enforced system. My important point is that filtering out traffic from an area doesn't need a standard approach. We have a variety of treatments and many ways to write traffic orders and so there is a great deal of flexibility out there. One modal filter not mentioned, but used in that there Netherlands is the bussluis. To an extent it's just a slightly more sophisticated version of the Eric Street layout, and similarly has the merits of allowing ambulances and fire tenders through, whilst preventing cars from making the same manoeuvre. I do wonder why these haven't caught on in the UK beyond being placed at the entrances to some guided bus routes. I know that legally we cannot create 'traps' on the highway, but if we have rising bollards - ready to go through the engine bay of the unwary - then something as obvious as a bussluis installation should be OK? 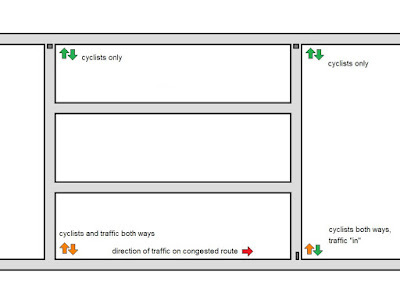 Have you ever tried to create CGI/CAD designs of real junctions or real streets based off of the Dutch CROW manual for roadway (and cycleway) design? I'm bad at art, so I haven't really done so for a long time. "the circular signs are wrong as they mean "no vehicles", it should be a sign meaning "no motor vehicles" as cycling remains permitted"
Does that mean any motorist caught entering this filter at the wrong time has the defence that incorrect signage is in use?